Two coats, one layer of Toma 45 second top coat (I didn't use a base coat because I'm wearing acrylics which have a uv gel top coat on them). Generally, I'm not a fan of nudes, greys or beiges. This, however, I do like. This is quite a 'bright' grey. It catches the eye because it has a blue undertone. 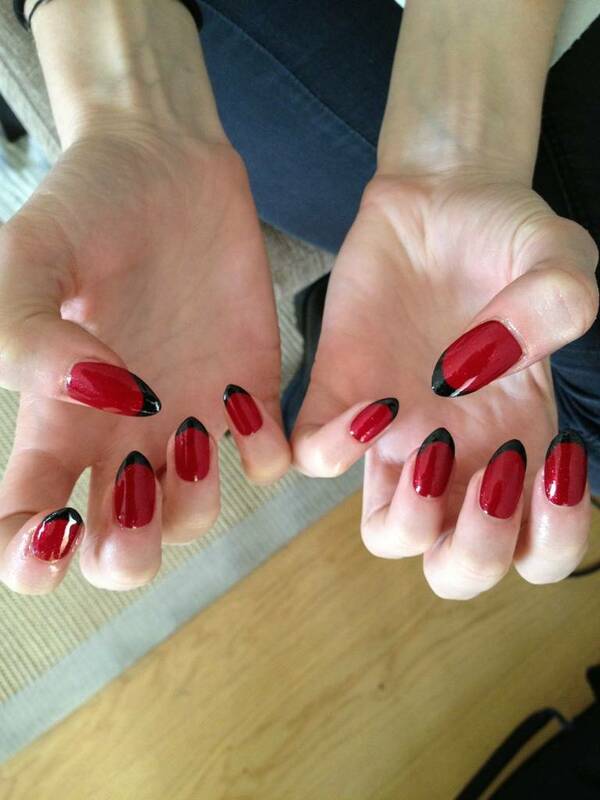 Another shot of the 'racer back' nails look created by Madeline Poole. You can find a tutorial for this look right HERE. Today I have a polish for you that I bought before Christmas and never worn. It was the holographic particles that swung it for me. This was amazing in the bottle, subtle on the nail, but so difficult to capture with the camera. Far better in real life - really! I can't really fault any of the Barry M nail paints. 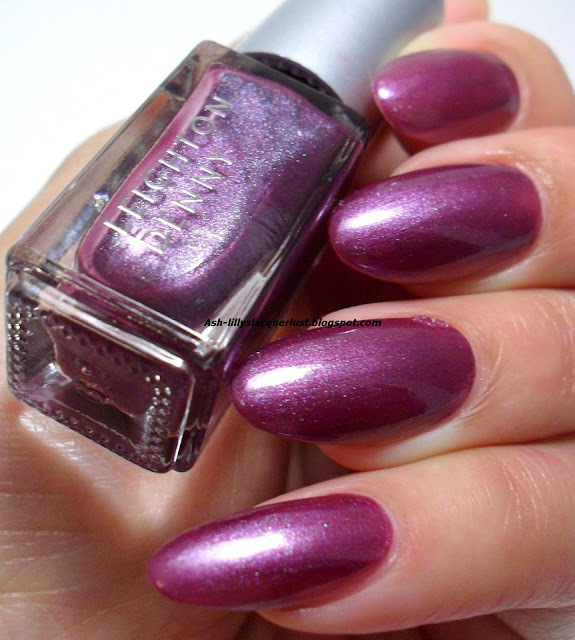 They always seem to (quietly) release new polishes with such regularity. I'm also using a different top coat at the moment. Recently I went to my local beauty supply before a shoot and I was horrified to find that there was NO SECHE VITE in the store. As the blood drained from my face, the sales assistant said, 'you can try Toma'. I was at a loose end, because all I had in my Helmer was the OPI Rapid Dry (and I don't particularly like it), so I grabbed some Toma. I'm happy to report that this was a very welcomed alternative to Seche Vite, for me anyway. There wasn't an issue with shrinkage either! 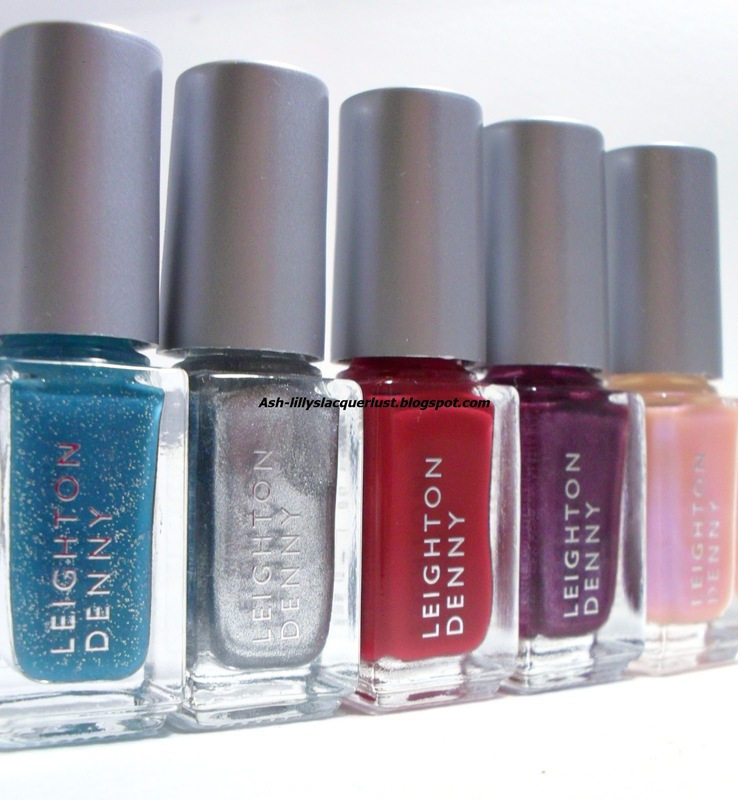 I have something special to show you today - Leighton Denny 8 piece Mini Mani Collection from QVC! 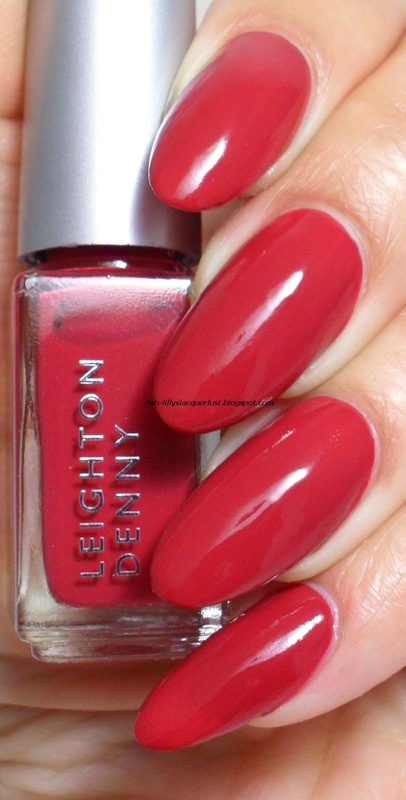 Admittedly, I've never used any of the products created by Leighton Denny, but I'd heard that he had some amazing polishes. When I was offered the chance to review this nail polish set, I had to accept. The set comprised of 5 colours. L-R: High Flyer, Diamond Diva, Rampant Rose, Pleasing Purple and Butterfly Wings. 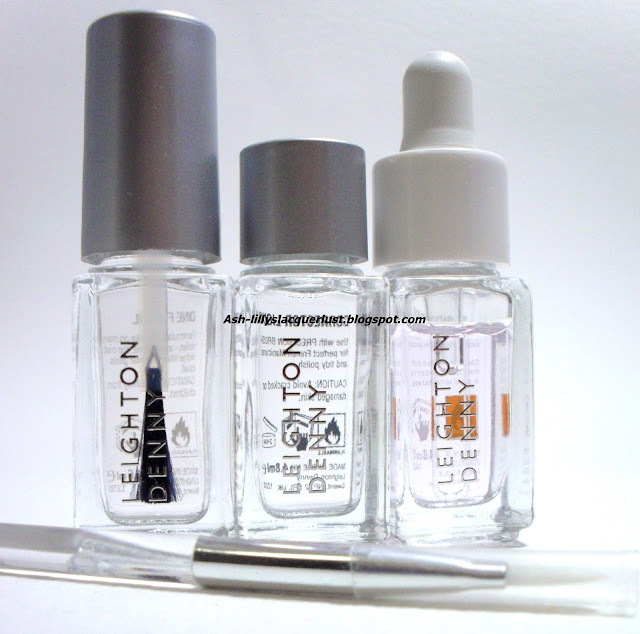 L-R: One For All (base and topcoat), Precision Corrector and Miracle Drops Speed and a precision brush. High Flyer (4.6ml) - a turquoise shade enriched with silver glitter. This is two coats plus on layer of the One For All topcoat. This was my favourite shade. The brushes weren't wide and flat, but they were well made and the consistency of the polish was creamy. Diamond Diva (4.6ml) - molten silver shade which can be used as a French manicure tip. I chose to put it on the whole nail, however, because I don't like how the look of a French manicure on almond shaped nails. 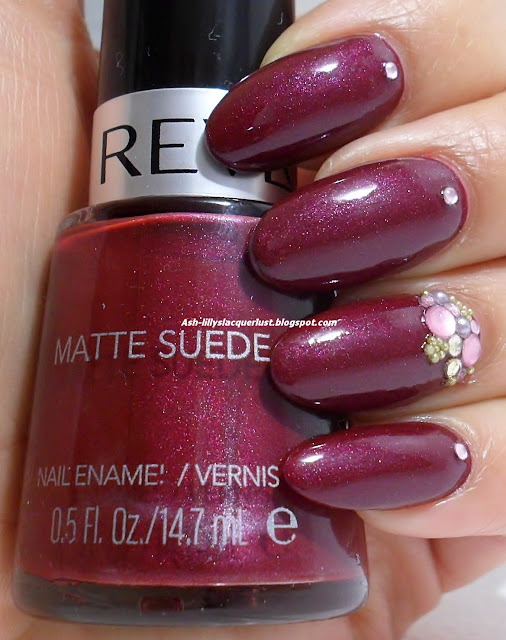 The polish is beautifully pigmented and would look amazing marbled with a black polish. This is two coats without a top coat. Rampant Rose (4.6ml) - deep red with a touch of brown. Two coats of creamy perfection. Pleasing Purple (4.6ml) - The website states that this is a 'navy blue with a subtle purple shimmer', but I suspect that they swapped the colours around. This is a PURPLE with a BLUE shimmer, in my opinion. 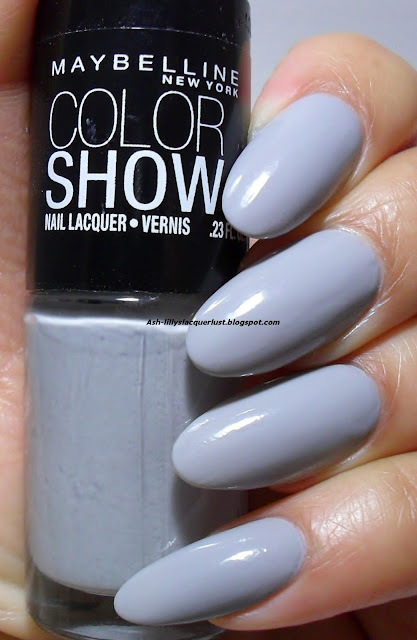 Initially I didn't like this at all, but after three coats, it grew on me. You may be able to detect a smudge on the ring finger...I used the polish drying drops and they did nothing to speed up the drying process. Butterfly Wings (4.6ml) - sheer peach with an iridescent shimmer. This was my least favourite shade, because I'm not fond of shimmers. I will admit that this shade would look amazing layered over a darker colour. This didn't actually occur to me until just now!! Left: One For All (4.6ml) all-in-one base coat, top coat, ridge filler and clear gloss coat - perfect for when you're on the go...or so the blurb says. It is fine as a base coat and gives a lovely glossy shine when applied as a top coat, but because it is not fast drying, I simply would not buy this. This is not a reflection on the quality of the polish, I just prefer the convenience of a fast drying polish. Middle: Precision Corrector (4.8ml) - a three-in-one product that tidies up nail polish mistakes; also the key easily creating the perfect French and Naked Moon manicures. I love this! Seasoned nail polish bloggers will all confirm that a good 'clean-up job' is imperative, when polishing nails. This does not appear to be acetone, because it does not leave a dry, white mark on the cuticle area after use. It's not harsh on the skin and it removes spills with precision and speed. I don't know what is in this miracle elixir, but I love it. The little brush contained in the pack is the perfect size and the hairs are stiff, so they don't splay when you are cleaning the cuticle area. Right: Miracle Drops Speed (4.8ml) - specially formulated to radically speed up drying time, help stop smudging and add lustre to nails and cuticles. Unfortunately, the only thing these drops did for me were make hydrate my cuticles! After a few minutes, my nails still smudged. Again, perhaps I'm just used to my normal fast drying topcoats, but I'm not used to having to wait for my polish to dry anymore! Overall, this was a sweet little pack with some top quality polishes. If the top coat had been a speed-dry polish, I would have been in heaven. If you go head over to the QVC website, you can find this set for the introductory price of £28.44. A few weeks ago I was in the mood for some Eton Mess. Yes, that lovely, simple dessert comprising of meringue, strawberries and whipped cream was on my brain for days. When I'd made up my mind to go and buy the ingredients, there was not a strawberry to be found at my local Sainsbury's! It was when I was staring at my lonesome double cream in the fridge, that I had an idea...strawberries and cream!! 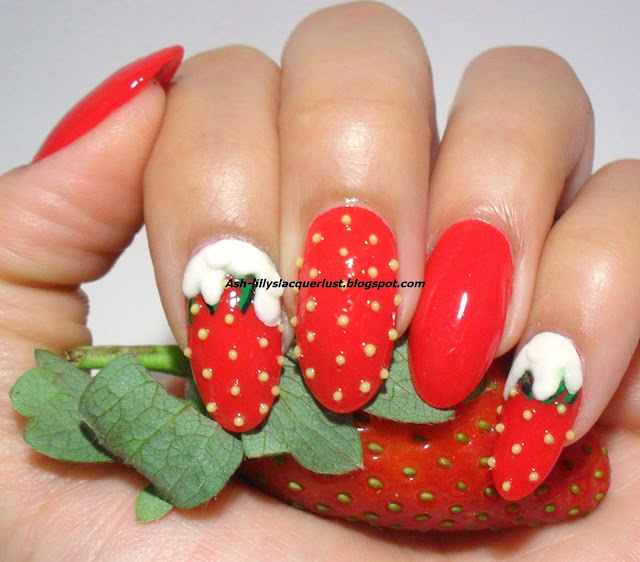 You'll see that I found my strawberries in the end! I went for pouring cream...made out of acrylic. The white acrylic powder was sent to me along with 17 of it's colourful friends, courtesy of Born Pretty Store. If you've never visited before, please do - and use the 10% discount code in the sidebar for any purchases. Out of the 18 tiny pots of acrylic contained in the package, I used the one pot of white powder with a monomer, or acrylic liquid. Because the powder is specifically for creating art structures, it was 'slow setting' and I was able to mold and shape the acrylic without it drying out too quickly. This acrylic is a different consistency (in my opinion) to that which you would use to create a french tip on a sculpted acrylic nail extension. 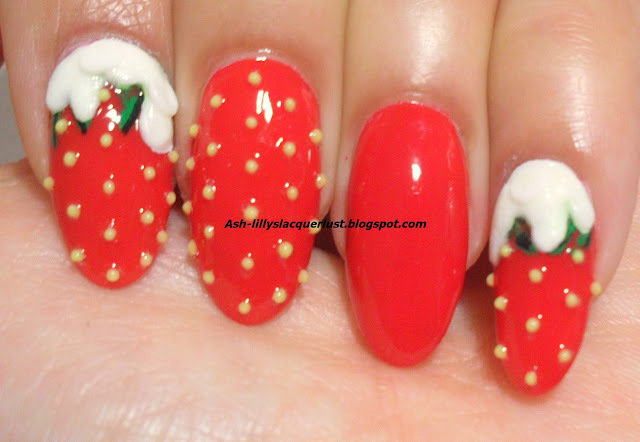 Unfortunately I spilt the little pot of powder after doing these nails, hence why I left the two fingers 'creamless'. Honestly, I could've kicked myself. The 'seeds' are plastic yellow bullion. 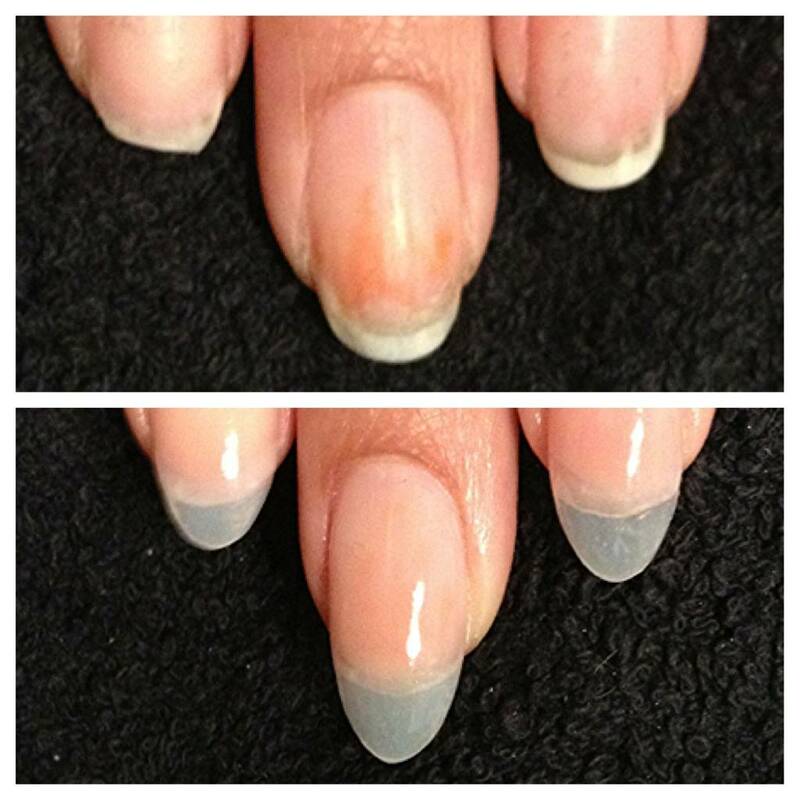 No glue was used - they stuck quite well in a clear top coat which was covered in a further two coats of Seche Vite. 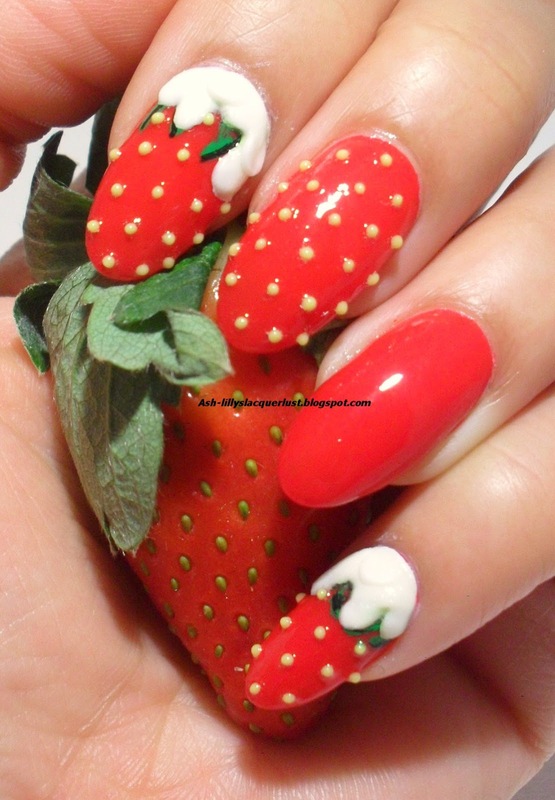 Another gratuitous shot of the highly sought-after strawberry. 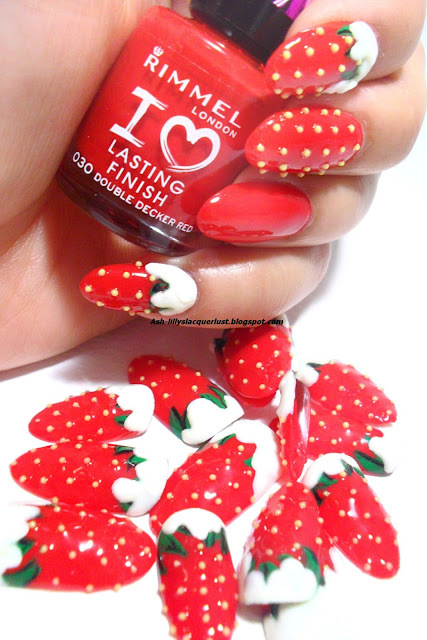 I loved them so much that I decided to make some false nails...using some white molding acrylic powder (for extensions) which has a different consistency to the previous powder. It wasn't the same, but I had to improvise because having this idea bouncing around in my head would cause me to have sleepless nights. Really. I'm not usually one for wearing fruit on my fingers (it's not quite office appropriate, is it? ), but I thought these were cute. Would YOU wear food on your fingers?? 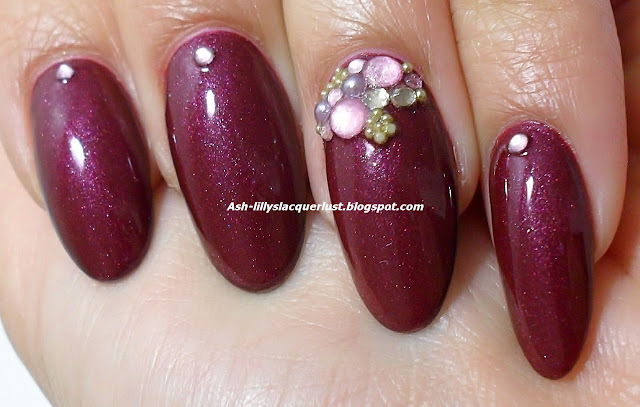 Here are some gel nail extensions that I did for GW recently. I now have a tiny lamp which is pretty powerful, so finally, I was able to capture some pictures of work I've done on others. When I work on clients, it tends to be in the evening and I never get decent photos because of the lighting. GW trusts my judgement when it comes to her nails and after I had removed some Gellux and acrylic holly (similar to what I am wearing in this post), she wanted to continue with a little length. I can't wait until my next party - it was so much fun! Recently I've managed to build up quite a few un-tried. What with frivolous polish buying and taking part in a Secret Polish Santa on Instagram, my second Helmer (yes, I now have another) is now brimming. This is 2True's 'Shade 3'. This is two layers of a blue jelly polish jam packed with glitter hexagons. So jam packed in fact...it was quite thick. I some of the hexagons were standing on their sides - that's how thick the consistency was. I had to pat them into place! Stroking this onto the nail was not easy. I think I may have to add a few drops of polish thinner before wearing this one again. It's really not bad though because this only cost £1.99 (from Superdrug). You know what it's like. You do a mani, you remove it and then you forget to post it? As I've already said, my New Year's resolution is to be more organised in terms of blogging (and schedule posts if I know I have a busy week). I also need to make more use of my blogging app on my phone too. Here are a few things I've done recently. Some press-on's I did for Annie for a photo shoot. 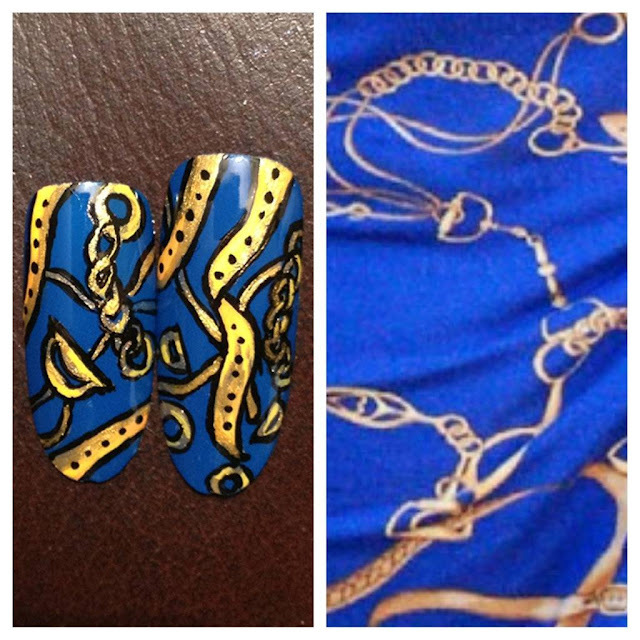 This pattern was created with acrylic paint and Nails Inc's Baker Street. The acrylic extensions I gave myself for Christmas. I had some staining which I covered with a rose blush acrylic.